Kim's Kitchen Sink: Happy Purim! 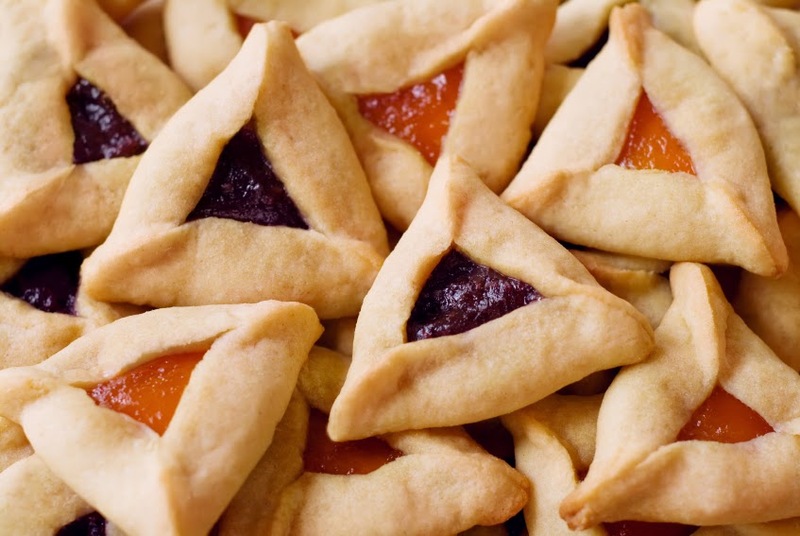 The wonderful Jewish holiday of Purim is on Saturday! It's one of my favorites, so I thought I'd share a little bit about it. Big thanks to my girl Stephanie Nudelman out in NYC for being my "second pair of Jew eyes" to proofread this for typos and accuracy. Literally, the word "Purim" means "Lots", which is kind of morbid, because Haman (the bad guy) cast lots (aka choosing by lottery) to randomly pick a date to destroy the Jews. What a cool guy. More on that here from a sweet rabbi with an animated video. But you didn't want a definition, you wanted to know what this holiday is all about. Well, like most Jewish holidays, it's about celebrating how we didn't die when someone wanted to destroy us. Fun! You may have heard the old adage, "They tried to kill us. We won. Let's eat!" -- it's pretty accurate. So what's Purim all about? Imma break it down for you, easy peasy. Story Time! Purim is a super sick feminist story from the biblical book of Esther. Esther was this hottie Persian Jew, living with her cousin Mordecai who happened to be the de facto Leader of the Jews. Nice cousin! The King was lookin' for a wife because his old wife Vashti wouldn't strip for his friends when he was like, "you're hot, I wanna show you off", and thus was sent to be beheaded (thanks to Stephanie for reminding me about that fun fact)...so with Vashti out of the way, he had everyone get together for a Parade Of Potential Harem Ladies. Mordecai was like, "Yo, E! You should go out for that parade! You're beautiful, and you're also super smart so maybe you'd bring some diversity to that harem!" - she paraded, and the King thought she was the Most Pretty Lady In Persia. Esther joined his harem, which, at the time, was a pretty good gig for a lady. 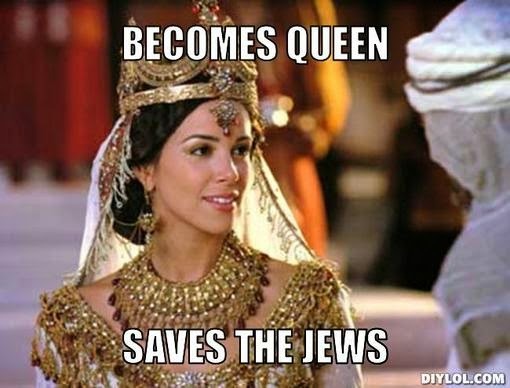 Anyway, the King loved Esther more than everyone else, not knowing that she was a secret Jew (she had to keep it a secret because not everyone in that castle was pro-Jew), because she was basically all-around awesome and smart...in addition to being hot. Meanwhile, there's this bad guy named Haman. He wears a 3-pointed hat, is the advisor to the king, and is generally just an egomaniacal, anti-semitic a-hole. 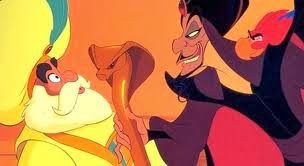 Think Jafar from Aladdin. He hates Mordecai because he won't bow down to Haman...and Haman's the type to hold a grudge. So what does he do? He vows to destroy the Jewish people. He picks March 13*, a random day (by casting lots, remember?) and is like, "Yo King. 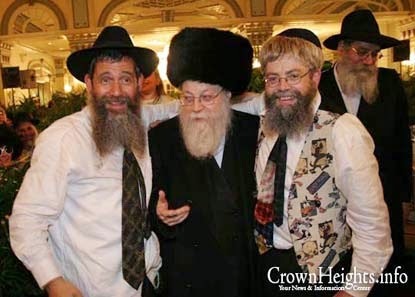 The Jews are totally different from us, and they follow different religious laws, and (even though we've been living peacefully forevah) we should get rid of them." The King was not the brightest crayon in the box, and he was like, "ok, whatever you say, Haman, you're my advisor and I totally trust you." Mordecai was like, "ESTHER! YOUR 'BOYFRIEND' IS GONNA LET HAMAN KILL US. YOU HAVE TO SAVE YOUR FAMILY! GO TALK SOME SENSE INTO HIM PLEASE! STAND UP AND SAVE THE JEWISH PEOPLE" Esther was like, "uhhh if I go talk to him without being summoned, he might kill me, because that's the way things work around this harem, but...this is serious, and I'm a badass, so ok."
Meanwhile, the King was having trouble sleeping (maybe because he'd agreed to exterminate a people? probably not...) -- he had his servants to read to him some recent Chronicles, which included the bit about how Mordecai saved the King's life. The King was horrified to learn that Mordecai hadn't been rewarded for this deed yet, and asked Haman how he should reward someone who the King wants to honor. Haman, who had been on his way to ask the King to hang Mordecai (because grudge-holding), thought the King was talking about him, so he was all "bestow the finest honors, put him in royal robes and parade him around the kingdom!" The King was all, "KEWL, THX, go get that started for Mordecai!" OOOH SORRY HAMAN! Haman, leading Mordecai around town. Anyhoo, that happened, and meanwhile Esther had been fasting for three days to pray and mentally prepare herself to ask the King not to kill the Jews. She bravely went to see him even though she hadn't been summoned, and he was like, "Oh, Esther, I love you, you can come see me anytime!" To which Esther replied, "Really? Cool. So about that...I maybe forgot to tell you that I'm actually Jewish? And remember when you told Haman he could kill the Jews? Hey, don't let Haman kill me and my people." The king loved her so much that he didn't want her to die, plus he was pissed because he liked Mordecai now too, so he hanged Haman (and his 10 sons, just in case) on the gallows Haman had built for Mordecai. [cue Alanis Morissette] Mordecai became Prime Minister and Esther was awarded Haman's estate. Aaaaaaand the King reversed Haman's decree, and the Jews of Shushan (in Persia) were saved! 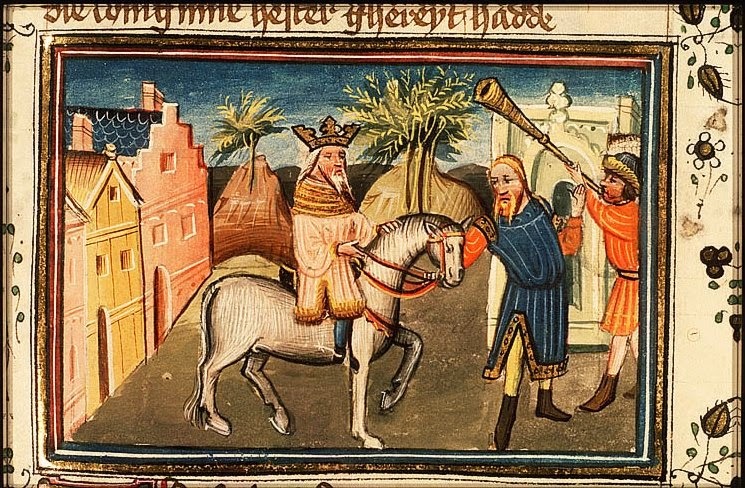 This year we celebrate on March 15*, the day after Haman's intended Jew-Destruction-Day, because that's when the Jews celebrated way back when Esther saved them. The main requirement of Purim Celebration is telling the story of Esther. Which I just told you! Commandment: Fulfilled! During the telling, you're supposed to boo, hiss, make noise with noisemakers whenever Haman's name is mentioned, to "blot out the name of Haman". Along with storytelling, the other commandment is to eat, drink, and be merry...according to the Talmud (the interpretation of the Torah), we are required to drink "until you cannot tell the difference between 'cursed be Haman' and 'blessed be Mordecai'" -- whatever that means for you. Unless you're a recovering alcoholic, or you just don't drink in which case you are exempted from this commandment. Ain't no party like a Purim party! Delicious, delicious evil jam hats! *Technically, we celebrate on the 14th day of Adar, which is a month in the Jewish calendar, and it's too complicated to explain here...so just know that Purim is usually in March. You're Right! Purim is fun! Yup. Thanks for reading! See also: this video by The Maccabeats, which (kind of) tells the story of Purim. That was awesome. You know how to tell it right. The most awesome explanation of Purim ever. This is the greatest. Chag Sameach! And a Chag Sameach and a Shoshan Purim and a BOO HISS HAMEN to you too! Evil jam hats = my favorite description of Hamentaschen ever. Thank you. I admire the Jewish traditions full of meaning! Evil never tasted so deliciously jammy. time as this?” The point, maybe you (Esther) were put in the position you are in for such a time as this, if you do nothing, God will make another way, but you and your family will carry the shame for having done nothing. The entire point of this story is God's deliverance for his people. Not that a very reserved young lady named Esther was some Snooki wannabe. By the way, according to the law, no-one including the King could reverse the law. The King added a law that the Jews be allowed to defend themselves, and about a year later is when they fought and succeeded. Why tell a story if you are going to take away its dignity and reverence. You made it sound like reality show trash.